The 3 piece kit consists of a earpiece with microphone, dongle to plug into the radio and a remote PTT button which can be worn round the neck or mounted in a vehicle (Remember it will need to be charged). It is a dream to use because it only needs to be paired up once, the process for this is laid out step by step in the manual and once this has been done the batteries will last for around 24 hours under normal use. 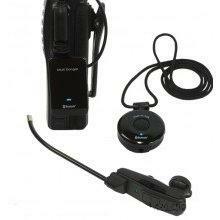 Once paired up you can use either the PTT on the earpiece or on the remote button to talk. To charge the kit you only need one 240v socket and all three piece will be fully charged in less than 2 hours.